It was a bittersweet end of an era for the cast of HBO series Game of Thrones as they took to the red carpet in Belfast. The hugely popular TV show will return to screens for its final season on Monday April 15, bringing the saga of who will rule Westeros to a conclusion. Inspired by George R.R Martin’s collection of novels, A Song of Ice and Fire, the television adaptation has dominated TV screens since 2011, with millions of viewers tuning in worldwide. Fans of the show have been counting down the days for season eight of the epic fantasy series after a dramatic season finale in August 2017. The season seven conclusion saw viewers find out the truth about Jon Snow’s lineage, and the terrifying Army of the Dead break down the Wall. Season eight will kick off to an explosive start but fans will have to wait until 2am on Monday to have their burning questions answered. A collection of the show’s well-loved characters took to the red carpet at the Waterfront Hall in Belfast on Friday night for the final European premiere. The series has created many stars over the years, including Ireland’s own Liam Cunningham, Ian Beattie and Aidan Gillen. Dubliner Cunningham said that he’s hoping to head home to his native Coolock shortly, after spending time filming the hit series in Northern Ireland. “My mother’s still in Coolock, I’ll be down to her very shortly,” Liam told Independent.ie. Speaking ahead of the season premiere, Cunningham said it was a “weird feeling” wrapping up. Also in attendance was leading stars Sophie Turner and Kit Harington. Much of the Westeros filming took place in Northern Ireland, with a number of Irish faces making an appearance over the last seven seasons. 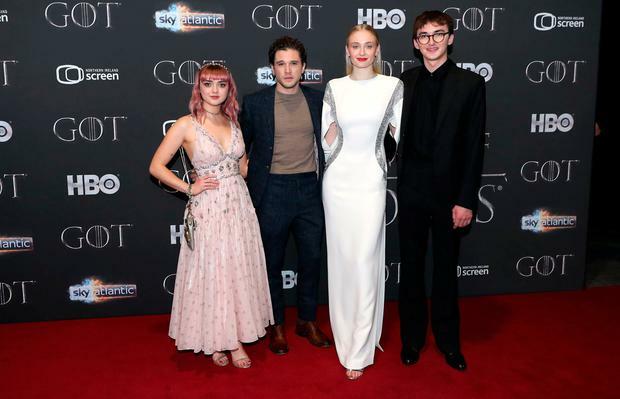 Isaac Hempstead Wright, who plays Bran or the ‘Three Eyed Raven’, said that his favorite part about returning to Northern Ireland was checking out the “new restaurants and bars”. “Me and Liam were just saying the other day, we love being here and in this city,” he told the Independent.ie. It also put Northern Ireland on the map for fans, with a new exhibition launched this week at the Titanic Exhibition Centre. The attraction will give visitors the chance to get immerse themselves in the world of the 7 Kingdoms, as well as an opportunity to see the legendary Iron Throne up close. Meanwhile in Dublin, an Irish café has announced that it will air all six episodes for fans in the capital. Union Café in Mount Merrion will screen season 8 starting next Monday April 15 at 9pm and serve free hot buttery popcorn to fans. Two bespoke Game of Thrones cocktails will be on offer - the Mother of Dragons with Belsazar Rosé and tonic, and the Dracarys with Belsazar Red and ginger ale. Game of Thrones returns to Sky Atlantic on Monday April 15 at 2am.